My name is Cindy McDevitt. I live and work on the East Coast of Florida and am a John Lyons Certified Trainer and Farrier. 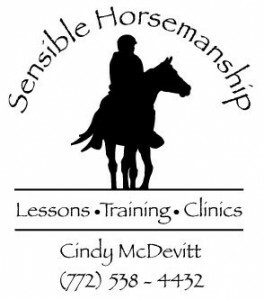 I travel to train, teach clinics and lessons and am a dealer for Specialized saddles. 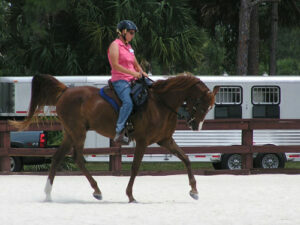 I have worked professionally in the horse industry since 1982 and have been riding in Specialized Saddles since 2004. Being a trainer I am always looking for equipment that is both comfortable for me and my clients and puts you in a balanced seat. Riding a variety of shapes and sizes of horses the optimal saddle needed to be light and easily fitted as the horses back changed through training and conditioning. I couldn’t afford to have a bunch of saddles to accommodate them all. I fell in love with these saddles right away since there wasn’t any break in time they instantly feel wonderful! When riding in Endurance rides my knees and ankles always feel great after finishing. That is a major plus! It’s nice to have a saddle that is not only comfortable for yourself but your horse as well. Once you have ridden in one of these saddles you will be hooked.